The melt tank experiences the highest temperatures of the glass production process. 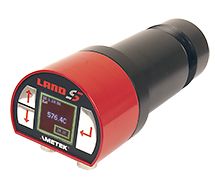 Real-time monitoring of these temperatures is vital to the efficiency of the application and the quality of the product. It is important to be able to study the entire tank interior to detect any structural damage. Reversals of the furnace’s burner and exhaust ports take place every 20-30 minutes, making traditional, slower-response thermal profiling difficult and time-consuming, with significant risk of human error. Real-time analysis is required to ensure overheating is avoided and the hot spot is located at the optimum point for fuel efficiency. Monitoring the condition of the melt tank enables interior damage to be detected and repaired, improving energy efficiency and reducing unplanned downtime. Thermal measurements in the melt tank also support process efficiency and consistent glass quality. Recommended Products - NIR-B Glass, Cyclops 100L, FG and SPOT M100. The condition of glass furnace Refractories is vitally important to safety and process efficiency, especially towards the end of the life of the tank. Deterioration of the refractories can increase fuel Costs, and may cause glass break-outs or refractory failure. 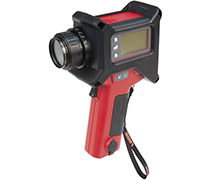 The NIR-B Glass is a borescope thermal imaging camera, specifically developed to return precise temperature measurements in glass furnace applications. 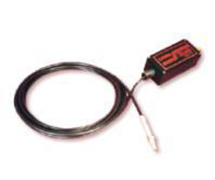 A simple fibre-optic, two-wire, loop powered thermometer with 4 to 20mA output. 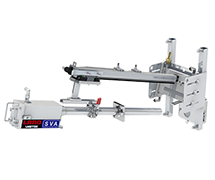 Specifically designed to improve process control in the glass industry.